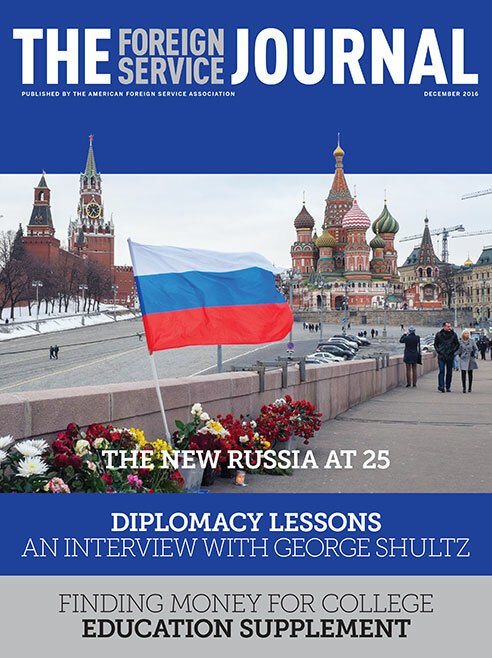 The December issue focuses on Russia and contains the FSJ's biannual Education Supplement. This tour d’horizon from the fall of the Soviet Union to today—including hopes, disappointments and missed opportunities—puts U.S.-Russia relations into perspective. Conversations in Moscow with Russians of different social strata paint a vivid picture of a country grappling with the meaning of the past quarter-century's upheavals. Young Ukrainian leaders battle Russian pressure, endemic corruption and a moribund economy in pursuit of a new, independent identity. This firsthand account of a fire in the secure area of Embassy Moscow on March 28, 1991, conveys the importance and drama of Diplomatic Telecommunications Service work during the last days of the USSR. George Shultz reflects on his tenure as Secretary of State in the Reagan administration and the process of making foreign policy and conducting diplomacy during the decade leading up to the fall of the Soviet Union. Scholarships can lighten the financial burden of a college education. Here are some tips on finding them. There’s a new college application platform on the block. Most schools aren’t using it exclusively yet, but underclassmen may want to set up an account and test its unique new Locker feature. There are more ways than ever to compare schools.